I have enclosed the handle from my 48" rear handle plus reef gun. Your records should show exactly when I purchased the gun. My best guess is 6 - 8 years ago. The form is also enclosed. You engraved 'DAWN PATROL' on my gun. This is the straightest shooting gun I have ever shot. I suppose the enclosed shaft has alot to do with its accuracy. One of the few misses I have had with it, was at Ventana, near La Paz about 3 years back I swam up on a 125lb. sail fish that was being chummed with bait fish from the boat, and missed right over his head at 12-14 ft. My fault, just anxious I guess. Otherwise I can hit an orange at that range every time. The picture enclosed, I am sorry has no speargun in frame. You can see the spear's entry point. That 51" - 48lb. striper was swimming directly away at about 10 ft.. I hit that orange size target. The shaft did not have an exit hole. It must have went pretty far in as he pulled _very_ hard when he gave up the sliptip had toggeled on nothing & was about to come out. That fish is at the taxidermist. 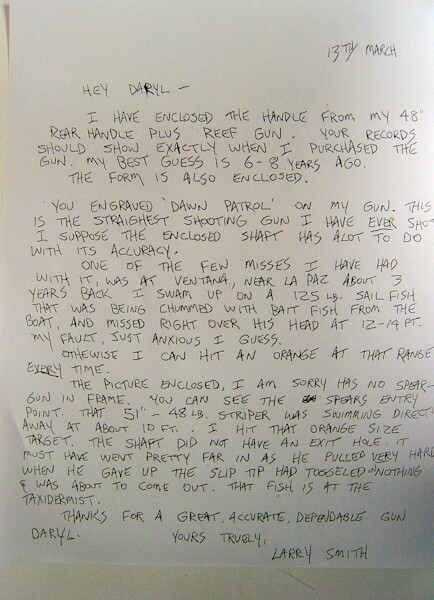 Thanks for a great, accurate, dependable, gun Daryl.